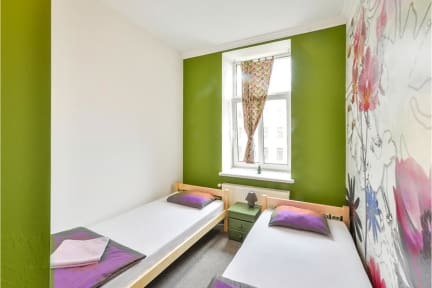 Riga Hostel i Riga, Latvia: Bestill nå! 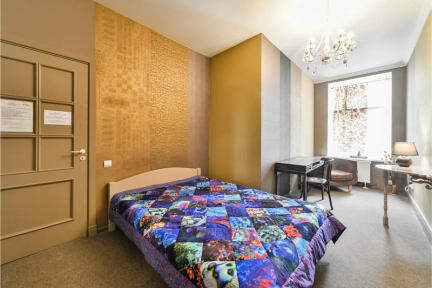 Riga Hostel is located in the historical center of Riga and has a wonderful, knowledgeable staff . It is a cheap, comfortable and friendly place with a relaxing atmosphere. The best place for travellers in Riga. Riga Hostel has a kitchen with a common area, where our guests will find everything necessary for cooking and eating, as well as a TV and a DVD player. Our guests can have free tea, coffee or hot chocolate, use a computer with internet or Wi-Fi at any time of the day. The hostel has a big movie collection for your use. You can watch a film, if the weather is not good enough for sightseeing. There is also a book exchange corner in reception. If you come with a car, you can leave it in our free parking (less than 10 min. walk from the hostel, previous reservation needed). We can also organize a pick-up from the Airport, if you are coming by plane. Riga Hostel`s friendly staff has excellent language skills and a great knowledge of the city. We will provide you with maps and other information about Riga and Latvia, and help you to find the best places to visit, see or go out, taking your interests into account. Kitchen with all necessary things for cooking and eating.